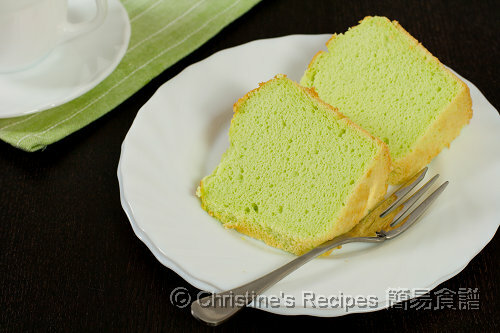 This pandan chiffon cake recipe has been sitting in my draft folder way long ago. This soft and fluffy chiffon cake is my family’s all time favourite dessert. I make this cake quite often. This cake is perfectly suitable for teas or party. Having posted the Chinese version of the recipe, I’ve nearly forgotten to translate and publish here. Thanks to the tv productions. Watching this season’s Masterchef, surprisingly found that Dan Hong's pandan chiffon cake was set as a pressure test for their contestants. The episode, shown on 6 June 2011 (Elimination Day: The race to recreate Dan Hong's dish is on), reminded me of this silently awaiting recipe. Upon viewing the episode, my urge inside yielded for trying Dan Hong’s recipe as I wanted to give my family a surprise. Too bad, after a long haul searching, Dan Hong's pandan chiffon cake recipe was not found on the Masterchef’s official site, even up to the time of this writing. Will try if it’s up there later for sure. Looking back to my old photos taken by my point-and-shoot camera two years ago, feeling it’s better to reshoot some new ones when I made this cake again. 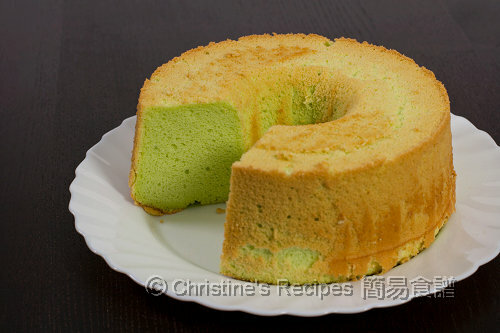 If you can’t find Dan Hong's pandan chiffon cake recipe like me, give my recipe a go. This cottony soft cake, with its subtle fragrance of pandan leaves and coconut, won’t let you down either. The cake was gone quickly. And I might bake one again for bringing along to a tea party on this weekend. Preheat oven to 170C (338F). Beat the egg yolks with a balloon whisk and mix in 20 grams of sugar. Add coconut milk, pandan juice, and a few drops of pandan paste (if desired). Combine well. Sift in cake flour and baking powder in three batches into the egg yolk mixture. Mix well. Lastly, add olive oil. Set aside. Pour into the cake pan and bake in preheated oven for about 35 to 40 minutes. After baking the first 15 minutes, if you find your cake gets browning, reduce heat to 150C（300F）, continue to bake until cooked through. A needle comes out clean when inserted in the middle. Remove cake from the oven. invert the pan immediately. Allow it to cool completely. Chop pandan leaves into chunks, pop in a food processor and add about 1½ tablespoons of water. Process to small pieces. Place pandan leaves in a muslin bag and squeeze out the juice. You need about 2 tablespoons of it to make this cake. If you don’t have a muslin bag, just use your clean hand to squeeze out the juice. I added a few drops of pandan essence so the cake is in light green. If you want a totally natural pandan cake, just skip the pandan essence. Your cake would look a bit light yellowish, not bright green though. Thanks for sharing, was waiting for you to post this recipe for a while. I love this cake but buying a full cake costs $8. I am wondering if you have any good cantonese recipes to be used with a slow cooker? This is a sure nice variation to the classic orange chiffon. By the way, take your time and share us your iPad photos : ). I love this cake and want to make one but i still cannot find cake flour anywhere in Melbourne, I tried Coles and can't find it. Any idea? You can get cake flour from Asian grocery stores. Any in Melbourne? I don't have access to pandan leaves but I know a place where I can get Pandan extract. How much would you suggest putting in the cake to flavor it? Every brand might be slightly different. I used mine with 1 teaspoon of it, got the colour like this, the picture shown on this post. You can get cake flour at Coles/Woolworths, it's in a blue box labelled as 'Lighthouse Cake, Biscuit and Pastry Plain Flour'(Anchor Brand), you can also get it at most asian grocery stores in Melbourne, labelled as 'low gluten flour' in english or something similar and '低筋麵粉' in chinese, priced at about $1.70 per 400g packet. ohh... yours look seriously good too. I love asian cakes. light and fluffy! Chiffon cake is still in m to-make list, I really have to get a chiffon pan! Looks so good! I've made chiffon cake a few times but find the cake get stuck to the ungreased tin even after it's cool. May I known how you managed to get the cake out nicely? This Pandon Chiffon Cake is just the answer to my prayer! I've got a house full of my son's young male friends with big stomach and huge appetite this weekend, a cake like this may just be enough for them to share! Hey, also from now on if I need to make a cake to take to a party, I know what to do now，thanks Christine !! I love the green hue of your chiffon. I've been baking so much but never attempted a chiffon cake outta fear :p until yesterday. That also under training session by my boss. Loved the result though! So light and moist unlike store bought stuff! pandan chiffon is one of the best tasted chiffons around, i usually will also add a little pandan paste to that, for colour and aroma! I tried the recipe today and my cake was only barely 3 inches tall after it cooled. What might I have done wrong? Probably the egg whites were not beaten or folded well. FYI, I uploaded two videos on youtube: how to beat and fold in egg whites. The links are on the right side bar of this blog. Thank you! I know I've beaten the egg whites right. Maybe I'm over folding them. Does it have to be an even spread of white or is it still a white and green swirl after folding? Should evenly fold-in, without any egg white traces or green swirl left anyway. Yet, never over stir it, you'll knock out the air inside the egg whites otherwise. Please take a look at the video of how to fold-in egg whites, the link is posted on the right sidebar on this blog. Thanks for the recipe. I have not baked ever. So, please allow me a silly question. Do I really have to get a mould that has got a hole in the middle? It is quite impossible to get it in any London Supermarket. Please enlighten me and let me know that a normal squarish mould would do. This kind of hollow cake pan is very helpful in making beautiful chiffon cakes. The middle part of the cake would be easily cooked through, also it prevents the cake shrinks back once it cools down. You could use a normal squarish mould to make chiffon cake too. I saw the contestants did that on MasterChef Australia. Just in case your cake shrinks a bit, hope you don't mind. cake looks amazing. i don't know if any London supermarkets sell pandan leaves so can i just use pandan essence? No problem. You could use a few drops of pandan essence if you can't find any pandan leaves. I baked chiffon cake using ur recipe but the cake turned out a little wet in the upper portion. However, the next day, it dried up more but still a little wet. Kindly advise me what went wrong. Except that I used Top flour and double action baking powder, the rest of the step I followed ur method correctly. I even baked much longer than ur recommended timing of of about 40 mins. Assume that all steps and methods used were correct, the only possible cause of problem was the temperature of your oven. If the top of the cake was still wet, the cake still got moist inside. It could be the heat over the top was not high enough. The baking time will vary, depends on the performance of every oven. Did you put a thermometer in your oven and check whether the temperature was right? Thanks Christine for your reply. Yes, I do use a oven thermometer for all my bakings. I think u may be right about top temp. I may use fan force in future for this recipe. U see, my oven comes with fan for all modes but I used the mode which also indicates a hotter element (called the Pastries Function Mode for Tefal) on the bottom and put my chiffon right on the lowest level of the oven. Do u think using fan force mode is ok for chiffon or for any cakes? Although my oven has got fan forced mode, I didn't use it. I just turned on the normal bake mode to bake this chiffon cake actually. I often place the cake in the middle rack. The chiffon cake comes out good everytime. Thanks Christine for your response again. Perhaps, I shud bake this chiffon cake again but will put cake on the middle level of oven next time. Fans in my oven cannot be turned off. All modes have fan force. Will let u know the outcome. Thanks for the recipe since I only know the baking mix which isn' t even half bad. For pandan leaves you could search for toey leaves which is the thai name for it. I am watching the masterchef episode on Dutch tv as we speak. After the cake was completely cooled down, I used a very sharp saw-blade-knife to remove the cake. Interesting! All the ingredients except the cream of tartar are not sour. The amount of cream of tartar is very small and won't affect the final taste of the cake at all. Did you check the expiring dates of your ingredients? I just bought most of the ingredients. Hi Christine, love how your blog has inspired cooks of all types....hope you don't mind me posting a tip about "cake flour", I've never bought cake flour because it is very easily obtained by adding 18g of cornflour to 122g of plain flour. Basically this makes 1 cup/140g of cake flour. Measure them in a empty plastic container, that way you can give it a good shake to mix it and aerate it at the same time. Hope this helps.....thanks again for inspiring all the cooks out there! If cream of tartar is added, the beaten egg whites won't collapse easily. You might like to replace with 2 teaspoons of lemon juice if you don't have any. Thanks for your input. Your info is very helpful. This looks lovely, so soft and fluffy! Hi Christine, i tried this last night, the bottom of the cake crack, but i don't mind the look as long as the taste is good. but when it cool down, it collapse & inside turn to wet. Seems that the oven temperature was not even. Probably the heat from the bottom was too high, so the bottom of the cake expanded too quickly before the inside was done, so still wet. 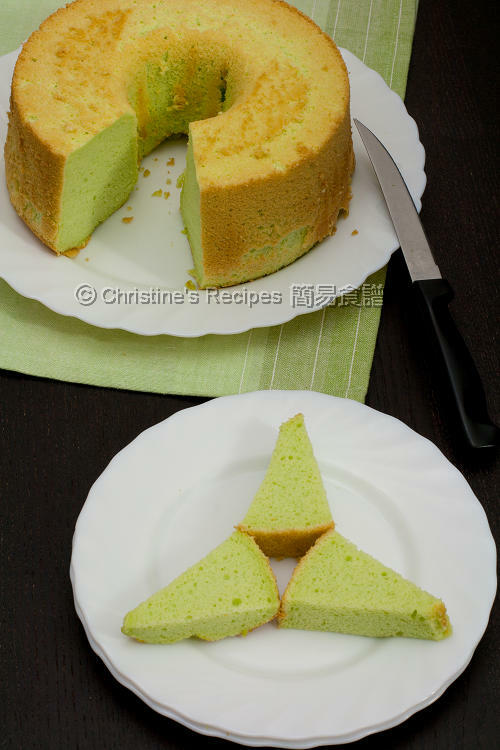 Excellent Pandan Chiffon cake. The amount of flour is just right to make the cake airy and fluffy. Not too heavy to take a second piece. Wonder if you have an orange chiffon recipe. @Caroline - I make this using plain flour - it works just as well! I dont use Olive oil though - sunflower oil is fine. And I use 4 egg yolks with 5 egg whites. So soft and fluffy! Hey Christine , great blog !!!! Thanks for the Pandan cake recipe and tips. Btw, is it essential to use that special tin cake with the hole in the centre or any tin will do ? Not essential to use that special cake tin, but it's very convenient and can produce best result because the cake can rise high, not easily shrink back. I tried to make this pandan cake but it did not rise well?, why is that? Pls help. The common problems of this chiffon cake not rising high are due to the beaten egg whites, either not beaten well enough or without correct folding-in. Did you have any chance to view my tutorial videos, on the right side bar. hi, i tried it and my problem is that when i bake it rise very beautiful but when i take out from the oven and about 1 or 2 mn it starts to goes down. I wonder what's wrong with it? Do you know what caused the problem of your cake? I'm not sure if it was because i use the cooking spray when i baked the cake. So, i guess it must be it. About beating the egg white and heating i did it as the direction. Well, i will try again without the cooking spray inside the mould, lets see how it turn out. I see. Must've been the greased mould then. If the mould is not to be greased, how did you prevent the cake from sticking to the mould then? baking paper? Hi Christine - just a quick message to say I tried out your pandan chiffon recipe and am very pleased with the result! I've tried making pandan cake a couple of times before, but with little success. I found your recipe easy to follow and the cake turned out light and fluffy. Only thing I would do differently next time is to keep the cake in the tin for longer as the cake started to break when I removed it from the tin to invert onto cooling rack. Thank you for leaving me your comment and the shout out on your blog. So nice of you. Hope you'd bake a perfect chiffon cake next time. 2. if I want to make a cocoa flavor chiffon, just substitute a tbs cake flour for a tbs of cocoa powder? You might replace with the same amount of coconut milk. And substitute the same amount of dry ingredients if you like. Wish you have a successful baking. Thanks for sharing Christine..just wondering can I use self-raising flour instead of cake flour? You could use self-raising flour. But the texture might be a bit different. hi cristine, can i use plain flour instead of corn flour? use the milk or water instead of coconut milk?? wat is the quantity of those?? thank you. Yeah, this chiffon cake is always a big hit in my family. Glad that you tried and liked it. Thanks for the shout-out ! I have tried to make chiffon cake from your recipe a few times. The last time I do it n it comes out hard on the 1st inch on the top n the next 2 inches of d cake is soft n fluffy. Is it due to me opening the oven halfway while it bakes? Seems that the problem of the texture of your cake was not because of opening the oven door. Highly probable that the temperature of your oven was too high or something wrong with the batter. I tried this recipe just now. The top part is crack after 15mins.. Is it because I put the cake tin abit high? anyway, I use the smaller cake tin. and I found the center part of the cake is shrink in, abit like hourglass shape, but the cake is quite nice. Highly likely that the temperature of your oven was too high or too close to the heating filament. So your cake expanded too fast, then in a result it shrank back. Thank you for sharing this healthy recipe (less oil and sugar). I have just made one using your recipe. It come out well although not as soft as I normally get using half cup oil and 220gm sugar. I am amaze that it taste just as good with less sugar and less oil. Hi, Is it a must to use coconut milk in this chiffon cake? The coconut milk and pandan flavour are perfect combination. I tried ur recipe and it turn out fabulous..! Thank you so much.. Was wondering how long can i keep it? And d cake tin doesn't have to be greased? Any suggestions how i can decorate it if i want to make it into a birthday cake? It's always gone very quickly whenever I made this cake. It'll be kept for a few days if without any deco on it. Yes, the tin doesn't need to be greased at all because it helps the cake hold the shape once it's removed from oven. I like eating it as it is, sometimes with some freshly beaten cream. If I do not own a food processor, how do you advise that I extract the pandan juice? I'd like to make this cake in a 1/2 sheet pan. I've read I can use a metal flower nail in the center for even baking in this type of pan but I'm concerned a chiffon cake won't rise. Have you tried this? Thanks in advance! Your cake looks delish! Do you have pestle and mortar? You can pound the pandan leaves in it, then squeeze by your clean hands. Or finely chopped the leaves and then squeeze. Can I omit the pandan leaves juice or substitute with something else? Thanks for your input. Sure, you can skip the pandan juice and replace it with other kind of juice. Your cake looks awesome! I tried baking it today and it looked good in the cake pan -a nice brown colour on top and the needle/chopstick came out clean when I stuck it into the middle. However when I inverted it, it was still very moist at the bottom and kind of collapsed on itself! Where do you think I went wrong? Thanks so much for the recipe! I am a big fan of your blog, as I have tried many of your recipes, and most of them usually come out wonderfully!!!! I just made this pandan chiffon cake tonight. The cake turned out quite well without any part shrinking. It was soft, fluffy and moist. However, I found out that the texture was not as smooth as yours. Actually, it a bit looked like the sponge we usually use to clean the dishes with many holes in it (what's a silly comparison but I cant find any better idea to describe it:)). I think I have beaten and folded the egg white correctly, otherwise the cake could not rise, right? So do you have any idea or suggestion about this problem?? Thanks a lot!! The problems you encountered are very common. As for beating egg whites, please refer to this video I posted previously on the side bar of this blog here. Also this video of how to fold in egg whites might help too. I finally made this cake! Sooo yummy! I found the Pandan juice at a Koren market called H Mart. If you add 1 Tbs of corn starch with 1 c of flour, it does the trick. It's not cake flour but it makes it much lighter than using regular flour. Hi.i want to ask about the step when we add in the flour,can we use electric mixer or must we fold in the flour? You can use electric mixer to mix in the flour. But don't over beat it. Hi christine,my wife brought it to work and all her colleagues love it and even say wanted to buy from me!i want ask u,when we add in the flour that part,can we use machine or must we fold in the flour? i fold the egg white until cannot see any traces but after baking ,i can still see white traces in the cake.why is that so? If you could see white traces after baking, then you'd know that the egg whites were not folded in properly although you didn't realize before. It's quite often that the bottom or middle part of batter is not mixed well. Try to scrape from the sides of your mixing bowl to bottom, and turn it over to top.